and the headline prompt was: Security: What makes you feel safe and secure? What rattles your sense of security? Where do you go for comfort and refuge? It has been through a number of permutations and has been hanging around for ages whilst I felt uninspired as to how to finish it. When I considered what makes me feel safe and secure I realised that I am most comfortable when I am not thinking insecure thoughts. When my mind quietens and the mental chatter stops I am left with a sense of peace that almost goes beyond safety and security. At such times I truly know that all is well. When the chatter starts up again and I am thinking insecure thoughts I worry about stuff in the future and create fear and insecurity. But beneath that the peace is always there. It just gets covered up by busy thinking. 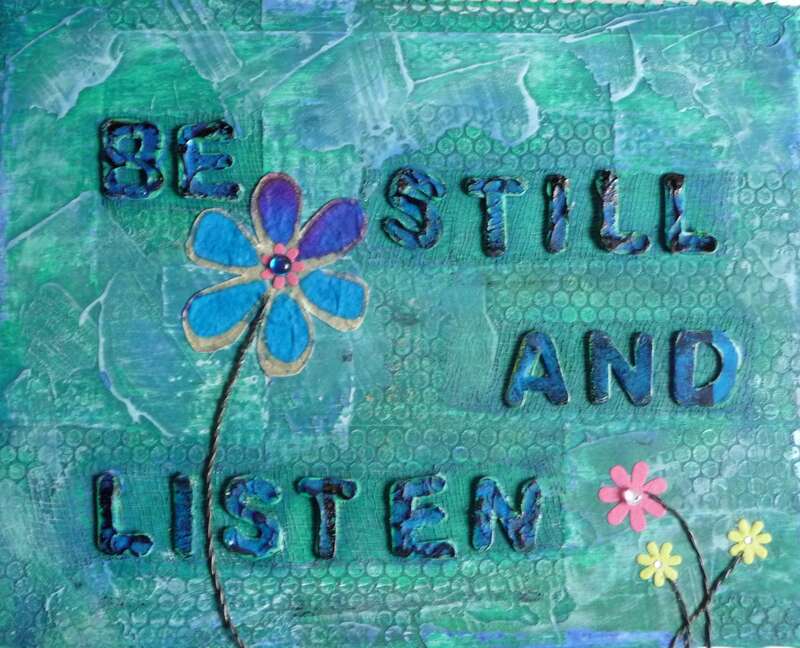 “Be Still and Listen” is a reminder of that. Here’s the quote prompt which I didn’t use: You can’t make a place for yourself in the sun if you keep taking refuge under the family tree. Helen Keller. I love the texture in this and such a true statement! You are so right about the chatter! Love the depth of your words (both literally and figuratively)! This is good reminder for me today as a whirlwind day begins- thank you – I needed this! So glad you are a part of Fall Fearless and Fly! What a beautiful piece. As I was still and just looked at it and breathed, I noticed the layers of gesso with the beautiful turqouise shining through. Lovely, lovely painting. Thank you for joining FF&F! Wonderful interpretation of the prompt!! I love the quiet, too. What a lovely affirmation-great layers! Happy PPF and FF & F! Beautiful colors, textures and words. Nice job! Good advice and lovely art, all wrapped up in one. Can’t ask for more than that. What great texture! you’ve got here–I especially love what you did with the letters! I’m loving everything about this. The saying, colors, layer and textures. Nice job! I found you on the Craft-O-Maniac Party. I also host a party at 6pm on Tuesday’s Fluster’s Creative Muster and would be thrilled if you linked up this post. Thanks Robin. I’ve made a note to link up next Tuesday!